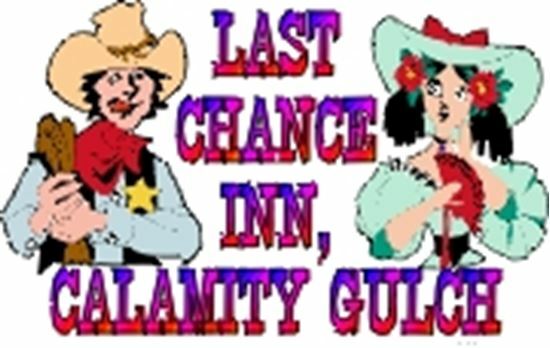 Ma and Pa Culpepper are in danger of losing their livelihood - the Last Chance Inn - to Horace Prickley, a representative from the loan offices of Gimme, Gimme & Gimme. In need of a son or son-in-law, the Culpeppers scheme to adopt and marry off pretty (but clumsy) orphan-turned-waitress, Patience Sweetwater. The intended groom is the newly-appointed Sheriff Virgil St. Vigil, who makes the rounds with his deputy and trusted side-kick, Princess Prettyfoot. Prickley learns of the Culpeppers' plot and enlists the aid of the beautiful Sahara Hartburn to "distract" the Sheriff from Patience. This whimsical, fast-paced melodrama offers sight gags, puns and an array of comedic supporting characters, including the sharp-tongued Ivory Keyes at the piano; the elbow-bending Happy Bartender; the Culpeppers' frumpy daughter, Chastity; the woeful Widder Black; and three tipsy Temperance Ladies. As much fun for the actors as the audience.